We are a group of friends from different nationalities (Spanish, Thai, and Italian) sharing a passion for good food and drinks, and, especially, for Spanish gastronomy and wines. Apart from our passion we share a similar background, with wide experience in the hospitality, restaurant and service industries, having all of us worked in different countries such as Thailand, the UK, France, Italy, Hong Kong, and (of course) Spain. We aim to bring our love and expertise on Spanish food and wine to Bangkok, and to share the amazing gastronomy and culture from Spain with locals and foreigners residing in this buzzing and lovely city. We’re looking forward to welcoming you in our “casa”... ¡Hasta pronto! “El Rinconcito de Juan”, opened in 2005, is the result of many years of effort. The restaurant, located in one of the most popular neighbourhoods of the Spanish capital, offers a gastronomic experience focused on the homemade traditional Spanish cuisine. Its most popular dishes are the “huevos rotos” (broken fried eggs) with various garnishes, the fried cheese with raspberry jam or the Spanish croquettes with different flavours. Moreover, the restaurant offers a great selection of wines, including 30 Spanish wines coming from different Denominations of Origin in the country. The restaurant incorporates new dishes and wines to the menu periodically, without losing its essence but providing its customers with new flavours, culinary innovations and always offering a homemade approach. 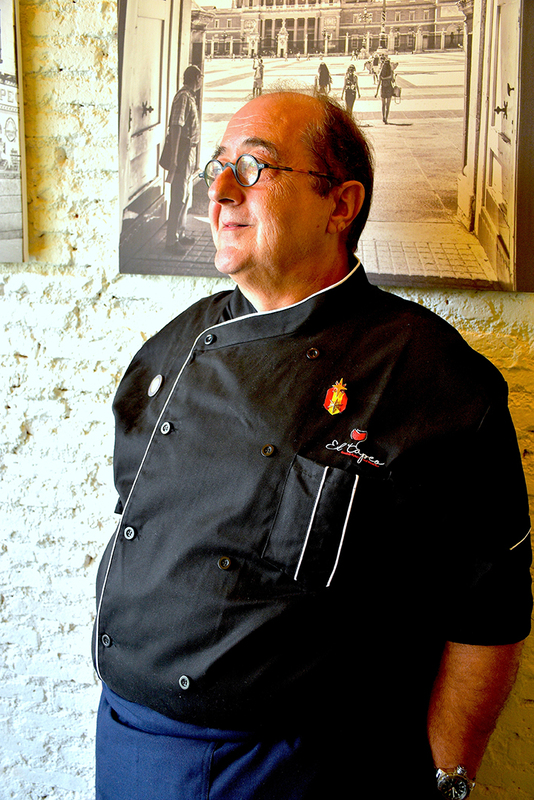 Rubén González is a real restaurant and gastronomy lover. While he was studying his Bachelor Degree in Tourism and Hospitality, he worked for different bars and restaurants in Madrid. It was during this time when he really discovered this world, in which he has been involved for almost 20 years. In 2003, he helped a friend to open a bar/restaurant, in which he was in charge of the establishment of the business, its operations and its management. This experience led him to open his very own business “El Rinconcito de Juan” a couple of years later. Apart from his entrepreneurial skills, he has engaged in different courses, trainings and specialisations on gastronomy and its different techniques. He graduated from an “Advanced Course in Professional Cooking and New Culinary Techniques” from the prestigious Escuela Superior de Hosteleria de Sevilla. Furthermore, he has complemented this course with different wine tasting courses organised by the Escuela de Hosteleria de Madrid. One of Rubén’s main objectives is to continually reinvent and update himself, by trying and experimenting new techniques and concepts regarding gastronomy. He has competed in several local “Ferias de la Tapa” (tapas contests) in Madrid. In 2013, he got both the first and the second prizes at one of these competitions with two of his creations: “Black rice arancini with squid leg and tartar sauce” and “Madrilenian squid sandwich with wasabi mayonnaise and squid-inked black bread”. 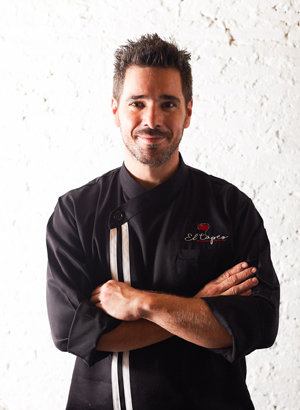 Now, he has embarked on a new project of managing the kitchen at “El Tapeo – Spanish Eatery and Wine Bar” in Bangkok. While he will still manage his restaurant in Madrid, he will travel to Bangkok as often as possible, in order to train our home- based staff and make sure that the menus and standards of the plates at the Thai branch keep up with the level of his original venture. Raised in San Sebastian, arguably the top gastronomic mecca in the Basque Country and Spain overall. Joseba holds over 30 years of kitchen experience. Apart from the Basque Country, he was formed in some of the most prestigious cooking schools in Madrid, France, Italy and Germany. His big step to move to the United States proved highly successful. In his over 10 years experience in this country he owned, managed, and run the kitchen in several restaurants, focusing on Basque and regional Spanish cuisine. In 2001 he became a Eurotoques Maitre Cuisinier (Master Chef of the European Union) and he was nominated four times for the James Beard Foundation Award in the category “Best Chef in Northwest USA”. He has spent the last decade in different countries in South East Asia, where he has worked for several restaurants and companies as a head chef, hospitality consultant and even gastronomy lecturer at universities. Now he has joined El Tapeo – Spanish Eatery and Wine Bar where he will bring his expertise in Spanish cuisine and tapas to the Thonglor buzzling neighbourhood.